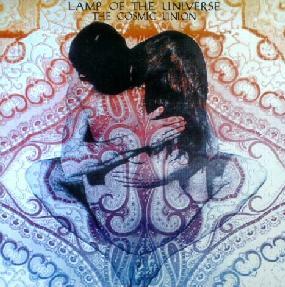 Lamp Of The Universe - "The Cosmic Union"
Lamp Of The Universe is a solo project from Datura bassist and vocalist Craig Williamson. What a surprise! For those of you who don't know them, Datura are a heavy Stoner rock band, while Lamp Of The Universe is a gorgeously lulling cosmic trip into a paisley colored psychedelic land of celestial ragas from Williamson's guitars, sitar, synths, and tablas. We're talking track titles like "Lotus Of A Thousand Petals" and "Tantra Asana". Believe me, these describe the music on The Cosmic Union perfectly. Lightly strumming acoustic guitars and sitars drift throughout as the tablas and other percussion keep a simple but effective psychedelic pace. Williamson's vocals are equally light and drifting making for the perfect marriage with his music. Lots of beautifully meandering jams that will open your mind for exploring the alternate realms that you travel with Williamson to. There are aggressive moments too, particularly on "In The Mystic Light" which sounds like a jam off Amon Düül's Yeti album. And love that organ and shimmering guitar on "Freedom In Your Mind". Actually, though this might seem to be a 360 degree flip from Datura, that band really is far more psychedelic than most Stoner bands, and the epic track "Mantra" on Datura's Visions For The Celestial CD is in many ways really a heavier version of what we hear on The Cosmic Union. HIGHLY recommended to fans of deep space flower power psychedelia. Note that Cranium Music has released The Cosmic Union in a numbered run of 500, but are interested in licensing the CD for release outside of New Zealand. For more information you can visit the Cranium Music web site.